I would like to find fabric to make a Spiderman baby bedding set for our baby boy's super hero themed nursery. Which one of these fabrics do you think would look better a small room? I don't mind the baby's room being decorated in red AND blue but don't want it to be TOO red and blue. I'm leaning toward the fabric with the grey background and cityscape pattern because the neutral color tones down the strong colors and because a nursery mural of a city skyline is appealing to me. My husband collects super hero stuff like figurines, comic books and posters and wants to decorate using his Spiderman collectibles. I was amazed when I found this crib set because I thought we were probably the only parents in the world who want a Spiderman nursery theme. Apparently there are more comic book fanatics out there that have super hero baby nursery themes but not that many that have focused exclusively on Spiderman. 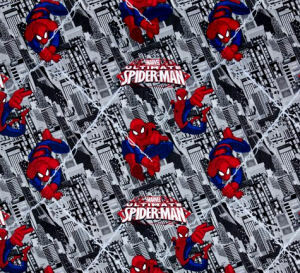 We are planning to repaint the nursery walls so the Spiderman baby bedding set won't clash with the paint color and I think that a cityscape mural would look fantastic which is why I'm leaning toward this fabric for the crib quilt. My husband's collection memorabilia will more than cover the need to buy the nursery's decorations and artwork. We will only have to buy the baby bed, a dresser and the crib set which means that we will actually save money with this theme but I'm wondering if this material qualifies as baby fabric or if it is the right set for us or if we should shop for something in a solid color with a subtle more subdued theme. Maybe if I saw a photo of a baby boy's room where it was used it would help. Does anyone know if Unique Baby Gear Ideas or another website might have pictures of a nursery decorated in superhero decor that I could use as an example? My husband collects a lot of super hero figurines, comic books and stickers and already has plans for a room decorated with superhero toys and collectibles. Thanks for the Spider Man nursery ideas; I hope that I can control this man! Join in and write your own page! It's easy to do. How? Simply click here to return to SPIDERMAN NURSERY PICTURES and DECORATING IDEAS.